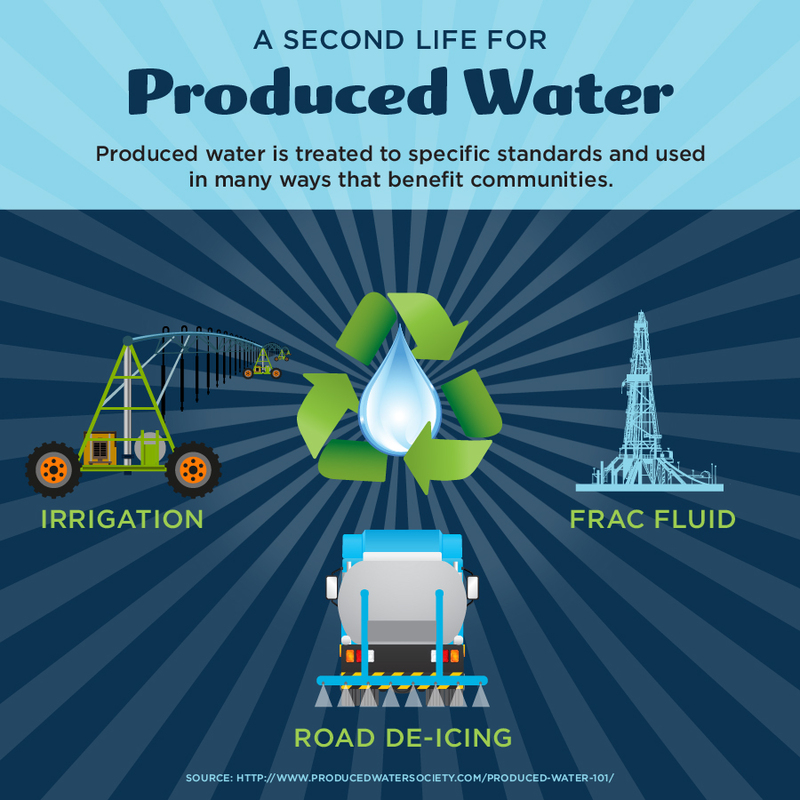 Let’s talk about water, which plays an important role throughout many natural gas and oil activities, including hydraulic fracturing, processing and refining. To reduce water use, operators and refineries continue to improve their water management and conservation practices. For example, Newfield Exploration Company is building a state-of-the-art water recycling facility in Oklahoma’s Anadarko Basin that spans 30-acres and will daily process roughly 30,000 barrels of water produced during well development. They’ve also invested a combined $40 million in water management infrastructure in the area. And Newfield is just one example. Operators and refineries across the country are investing significant time and resources to creatively reuse produced water, use lower-quality water in place of fresh water and build new infrastructure for treatment and conservation purposes. Natural gas and oil operators are identifying, testing and evaluating new technologies that reduce the industry’s freshwater demand. From self-cleaning water filters to software that tracks the movement of water, we are committed to research and development. Pioneer and many other operators currently utilize clean brine technology in the Permian Basin and across the country. This new process allows the company to use produced water that previously was unusable. Produced water is often reused to make drilling fluid and frac fluid for new wells. Produced water of a certain quality can even be applied as a de-icing treatment to keep the roads safe during winter storms. In addition, many companies continue to spearhead water management research that will benefit the industry and the communities they serve. Notably, Anadarko partnered with Energy Water Solutions, the Texas Railroad Commission, Gibson Energy and Texas A&M AgriLife Research on the Produced Water Irrigation Project. The project evaluated using recycled produced water from natural gas and oil operation in the Delaware Basin to irrigate a cotton crop in nearby Pecos, Texas. The study found that irrigation with treated produced water did not reduce cotton yield or lint quality. Further, in 2012, a group of nearly 20 North American exploration and production companies teamed up to create the Energy Water Initiative (EWI) – a collaboration focused on better understanding water used in hydraulic fracturing. The industry’s comprehensive effort to use water more efficiently in operations is better for business, and reduces our environmental impact. Operators within the Permian Basin and Oklahoma regions, for example, are investing millions in water recycling and conservation to reduce drilling and operating expenses. Devon Energy Corporation installed a pipeline designed to carry water to and from a recycling facility. By using this pipeline, the company has conserved nearly 300 million gallons of water. Devon’s efforts extend far beyond developing new equipment. The company also works with local officials to develop tailored water management solutions that benefit both their business and the communities in which they operate. For instance, in New Mexico, Devon spearheaded the effort for the necessary rule change to make water reuse economically feasible. At the same time, Devon worked with its vendors to adjust hydraulic fracturing chemistries, ensuring the success of the water reuse program. Over the course of the year, Devon preserved 220 million gallons of freshwater. Due in large part to water conservation efforts of operators like these, a Texas Water Development Board study, conducted by the University of Texas, found that water used for shale natural gas accounts for less than 1 percent of all ground and surface water withdrawn statewide. Operators are not alone in protecting the environment and conserving fresh water. Oil refineries constantly seek innovative ways to reuse water from and for its process operations and cooling towers, and to manage storm water. In 2011 Chevron’s Richmond Refinery instituted its Richmond Advanced Recycled Expansion (RARE) water project, a joint effort with the East Bay Municipal Utility District, recycling municipal wastewater into steam for refinery operations, freeing up 3.5 million gallons of fresh water per day for public use. Chevron’s El Segundo Refinery partnered with the West Basin Municipal Water District to use reclaimed municipal wastewater as the primary water supply for refinery operations, accounting for more than 80 percent of the refinery’s water use. Many oil refineries use cogeneration, which uses leftover energy from normal operations to produce additional electrical power. Not only does this increase refinery efficiency, it also requires less water than coal-fired boilers or steam-condensing turbines that generate the same amount of power. Through cogeneration, ExxonMobil and others can pass savings onto customers while conserving our natural resources. From on-the-ground operations, to research and development for the future, we invest in water conservation and management practices as part of our commitment to constant progress for the communities we serve.